FastMM4 + Delphi – Recompiling application with 10.2.1 causes memory leaks? 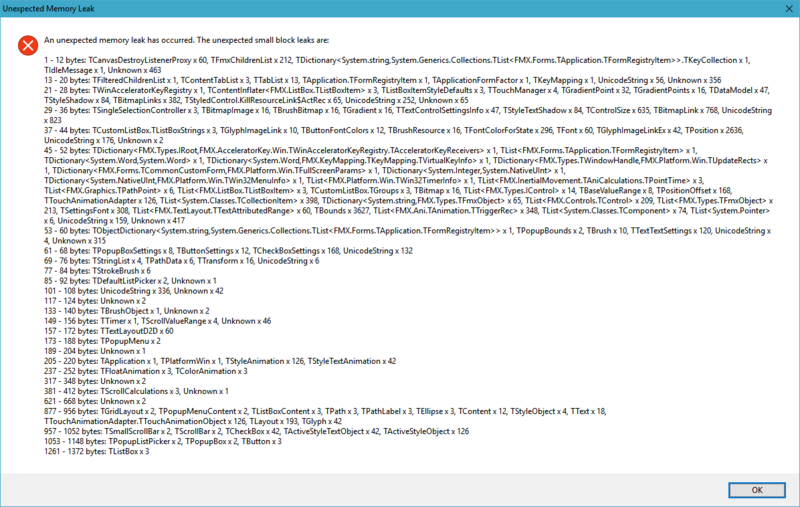 This is why you should always test your Delphi apps with FastMM4 and FullDebugMode enabled: [WayBack] Delphi – Recompiling application with 10.2.1 causes memory leaks? end of your .dpr file right before the end. It calls the [WayBack] System.Classes.CheckSynchronize method to ensure the background thread performs the needed cleanup. Thanks Stefan Glienke for solving this. This entry was posted on 2017/11/15 at 18:00	and is filed under Delphi, Delphi 10.2 Tokyo (Godzilla), Development, Software Development. You can follow any responses to this entry through the RSS 2.0 feed. You can leave a response, or trackback from your own site.